The text and the tune of the Christmas hymn “Away in a Manger” have both been erroneously attributed to Martin Luther. The traditional melody has also been attributed to an otherwise unknown and unidentified Carl Mueller. However, it is now believed to have been composed by James Ramsey Murray, a Massachusetts musician. The tune appeared with the first two stanzas of the hymn in his 1887 Dainty Songs for Little Lads and Lasses with the notation, “Luther's Cradle Hymn (composed by Martin Luther for his children and still sung by German mothers to their little ones)”. There is no evidence to substantiate this claim. In fact, researchers had known for a long time that the hymn could not be found anywhere in the 57 volumes of Luther's works or the 24 volumes of supplements. A possible reason for the spurious attribution is that the 400th anniversary of Luther's birth was in 1883. The words were probably based on a poem written for this anniversary, and credited to Luther as a clever marketing gimmick. 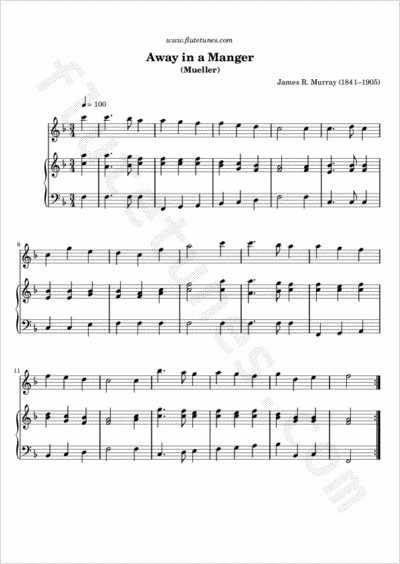 Murray's tune, also known as “Mueller”, is the tune most commonly played in the United States. Another tune, Kirkpatrick's “Cradle Song” is more commonly heard in Britain.